Necklift Evans and Augusta, Georgia–A defined jawline and a smooth neckline are signs of a youthful face. With time and aging, the skin in the neck begins to hang downward. Often this occurs with accumulation of fat, forming a “turkey waddle”. Individuals affected only by excessive neck skin and a “waddle” may be treated with necklift surgery at our Evans and Augusta, Georgia and Aiken, South Carolina-area cosmetic facial plastic surgery facility. 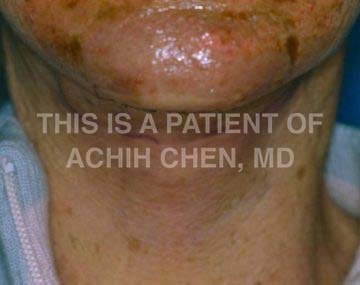 Dr. Achih H. Chen, our Beverly Hills-trained necklift surgeon, also serving visitors from Atlanta and beyond, can help you reverse signs of the aging neck using state-of-the-art necklift techniques for a natural, youthful neckline. Necklift Aiken, SC and Evans and Augusta, Georgia–Necklift surgery addresses signs of the aging neck by treating the excess fat, muscle and skin in the neck and under the chin commonly referred as the “turkey waddle”. Individuals who have excess skin in the neck and chin area most often also have jowling along the jawline and excess skin in the face. 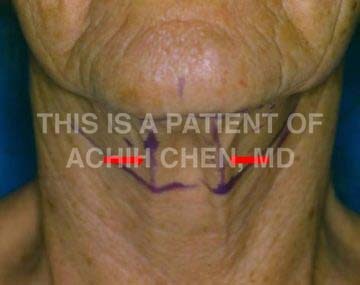 It is a rare circumstance when individuals, during the aging process, are only affected by excessive skin in the neck. While it is not uncommon for individuals to focus on their “turkey waddle” and conclude that necklift surgery is the best procedure to address their concerns, necklift surgery alone will often result in an unnatural appearance with the excessive skin in the face bunching below and in front of the ear. As necklift surgery is a part of facelift surgery, individuals who have excessive skin in their neck with associated jowling and excess skin in their face have the best result when treated with facelift surgery. Dr. Achih H. Chen can help you decide whether necklift surgery or facelift surgery will most ideally help you achieve your goals. Serving Augusta and Evans, Georgia and Aiken, South Carolina, our cosmetic facial plastic surgeon, Dr. Achih H. Chen is a skilled and seasoned necklift and facelift surgeon. He is happy to address any questions or concerns you may have. 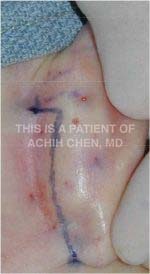 Contact Dr. Achih Chen to schedule a consultation. Necklift Evans and Augusta, Georgia and Aiken, SC–Necklift surgery, as a stand alone procedure, involves a small incision hidden under the chin and small incisions behind the ears. During facelift surgery, the necklift incisions are incorporated as part of the facelift incisions. 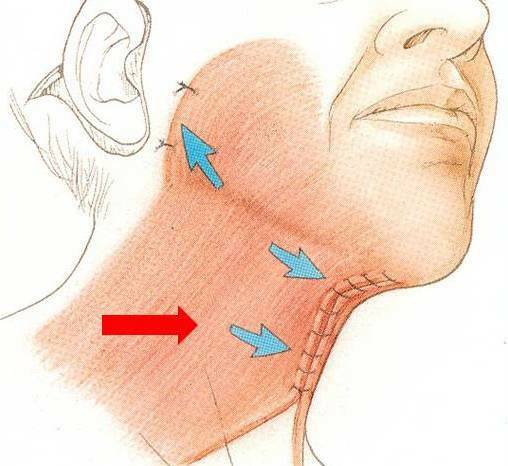 The chin incision allows removal of fat and tightening of the underlying muscle called the platysma muscle. The platysma muscle is a pair of muscles in which the front edges often present as two bands under the chin and in front of the neck. During necklift surgery, the front edges of the platysma are treated through the chin incision and brought together to remove the bands and close the gap between them. Through the incisions behind the ears, the back edge of platysma muscle is repositioned in a posterior and superior direction to tighten the neckline. As a result of the tightening of the underlying muscle, there becomes and excess of the overlying neck skin, which is removed. Necklift Surgery in Evans and Augusta, Georgia–Dr. 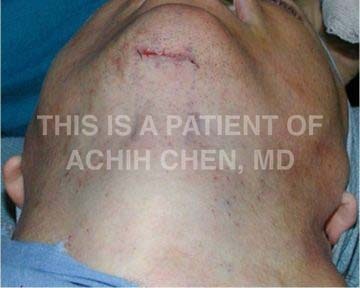 Achih H. Chen can restore your youthful neckline with his state-of-the-art necklift surgery techniques at the Georgia Center for Facial Plastic Surgery. Most commonly, individuals choose to have necklift surgery as a part of facelift surgery. They can also combine necklift surgery with other procedures such as Mid-Face Rejuvenation, Eyelid Surgery or Laser Skin Resurfacing for a more complete rejuvenation. Contact our cosmetic surgery practice, serving Aiken, South Carolina and Augusta and Evans, Georgia patients and beyond to schedule a consultation to discuss your concerns and goals with Dr. Chen.